Every day we scroll through social media and excitedly check out one great look after another. So many styles put together by beautiful, trendy and super stylish gals! We've followed trends from one rodeo, stock show and event after another...All the way from the NFR to WESA and next to The American and the list goes on! There are few things I enjoy more than watching new trends unfold and seeing the timeless classics that never go out of style honored in and out of the arena. Like anything else, the Western way of life comes with its own trends. Though there are lots of different disciplines in the equine and cattle businesses, and our styles may vary a little bit from one to another. There are same staples that never go out of style and create the ultimate "Style in the Saddle". The cowboy hat, a timeless necessity, will always top the list of Western Fashion must haves. Every true cowboy and cowgirl has a favorite hat with their own personal touch. Maybe the brim is a little higher or a little flatter, the crown a little taller, wider or rounder, maybe there is a dent on each side, or a dent in the back from that rank calf that got to it before you could when it hit the ground. And no doubt your favorite is the one with the permanent sweat stained hat band and finger prints on the dip. Custom, personalized hats are a big trend this year. Trendy shapes and hat bands also add some flavor to the look. The cowboy hat.. stylish, essential and a true western fashion staple. We can't even talk about style in the saddle without making Denim a hot topic! The main thing that helps a cowgirl get through a rough day in the saddle is the jeans. The right cut, fit and quality can make the difference in a good day horse backing and a GREAT day! Classic boot cut, mid-rise like the Kimes Ranch Jolene's or Betty’s are always a popular pick for comfort and style but this year cowgirls are adding some flare... Literally! The Lola Trouser Jean is Kimes latest addition to the lineup. For some time, the wider leg, cross over jean has been making its way in to barns and arenas all over the place, so imagine my excitement when Kimes added the Lola's to the Denim Line... After all, there’s a whole lot riding on the right pair of jeans! After the Cowboy Hat and Jeans, of course the Cowboy Boot has to be addressed! Right alongside the traditional ranch boot, exotics like ostrich, alligator, snakeskin, even elephant have been popular through the years but recently, there's a new trend popping up and it's a little "fishy"! Sea bass are a super popular choice for boots because of the comfort of the rag like hide. You just can't go wrong in a pair of comfy and fashionable boots. Pairs of boots are like potato chips.. you can never have just one! When we're on the farm or in the training pen nothing suits better than a favorite old t-shirt. And when the cold weather hits, every sweat shirt, jacket, sock cap and gloves we can fit on. But, when it's time to show up and look our cowgirl best, we're choosing a button down, collared shirts in every solid, pattern and fabric you can imagine! Some are choosing my personal favorites, the classic solid, stripe or subtle pattern and maybe a functional and stylish vest. Some of my, "step a little further out of the box" friends are going with fringe, neon’s and lots of sparkle! 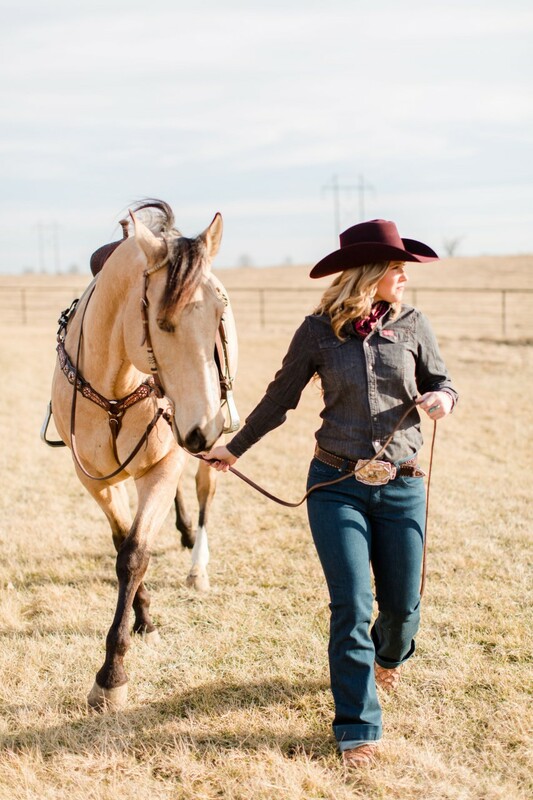 The waist up is where you'll see the true personality of each cowgirl come out through her personal style choices! Accessories, accessories and...accessories! As always... since the beginning of cowgirl time, accessories are a must. Okay, maybe it was a favorite six shooter in the beginning, so that's a little different, but still... We LOVE accessories! Turquoise...everything is great right now, rhinestone, (never goes out of style) ball caps, and a new favorite, which actually stems from the original cow pokes and outlaws... the wild rag. Its purpose serving and oh so stylish! It's always fun to watch the ever changing western fashion trends unfold, but even better to know that year after year, decade after decade the timeless classics remain, much like cowgirls themselves. Tough, determined, and always bringing their own..."Style in the Saddle".